Ever since I made red velvet cake truffles, my coworkers have been begging me to make some more, so I thought I’d try carrot cake truffles this time. I took the easy route and used a carrot cake mix. I don’t think it would be worth the effort to make a carrot cake only to crumble it up and make cake truffles out of it. These are much simpler to make than they look, they just take patience if you want them to look pretty. I am pleased with how they turned out. My friend Steve Penhollow even broke his 6-month dessert fast to try one and said it was worth it. Prepare cake according to package instructions. Allow cake to cool completely. Once cooled, cut off any hard or crusty edges. Crumble cake with your hands in a large bowl until it is broken down and fine. Mix in 1 container of cream cheese icing. I found it easiest to use my hands to do this even though it was extremely messy. Mix icing and cake until it has reached a consistency of a nice, even dough. Roll the mixture into 1/2 inch balls using your hands and place in the freezer until chilled but not frozen. Melt chocolate according to instructions on the package. I used the microwave and it worked fine, but others may prefer a double broiler method. Once the chocolate is melted, remove the balls from the freezer and dunk them one by one into the chocolate until covered. This process is a bit tricky, but I discovered it’s easiest to dunk the balls in the chocolate and remove with a small fork, allowing the excess chocolate to drain off before placing them on a a cookie sheet lined with parchment paper until hardened. 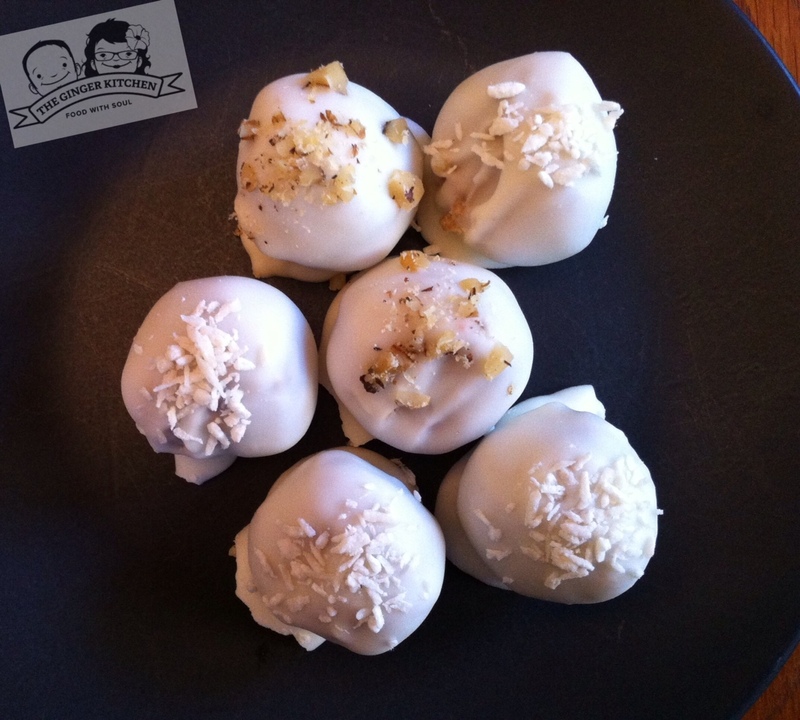 If you want to add embellishments to your truffles (I used coconut and walnuts), you must do so immediately or the chocolate will harden and they won’t stick. I have just added this yummy recipe to our B&B plantation recipe book! Thank you for the great idea! They look so cute! And your watermark looks like a card laying on the table. Maybe that’s a hint that you should market this stuff!! Haha- maybe! What a great idea.